This master processing kit includes our model L10 drill plucker, a medium kill cone, HD Apron, HD PVC gloves, a stainless steel scalpel, & a 10 pack of carbon steel sterile scalpel blades. Perfect complete kit for chickens, ducks, large game birds & turkeys up to 10 pounds. DRILL PLUCKER: Rite Farm Products model L10 drill plucker. Uses 10 of our large plucker fingers and has a 3/8" drill shank to fit any drill with a 3/8" or larger chuck. Specially blended latex rubber for the longest life and fastest pluck possible. Color is of a natural blend. Unlike the standard black rubber fingers, these are not chocky, will not dry out right away, will not crack, or fall apart after repeated use. KILL CONE: Rite Farm Products Medium restraining/killing cone. Cones make killing and cleanup easy by restraining the bird during bleeding. For layers, large layers, broilers, roosters, large ducks, and young turkeys up to 10 pounds. Measures 12.5 inches long and 10.25 inches wide. Built to last. SCALPEL & 10 BLADES: Stainless steel scalpel is #4 in size and is perfect for dispatching and processing a bird. APRON: Professional heavy duty 35 MIL thick apron. Large 35"x50" size with adjustable rear ties. GLOVES: 1 pair of 12" long black PVC gauntlet gloves. These gloves provide great flexibility, fit, & grip. Mens Large size are flexable and will fit most men. Making them for meat processors, trappers, skinners, butchers, chemical handlers, and more. 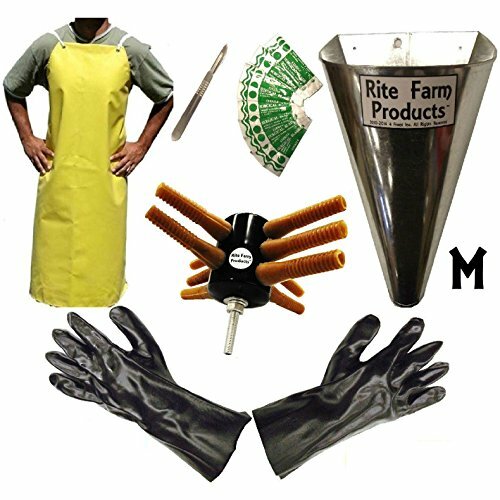 Everything you need to begin processing poultry!